I think most inventors share a common problem - lack of money. Why is it that the person with the idea does not have the money to back it up? The first mistake I made was not doing enough research on a used welder I had my sights on before buying it. It was a 1985 Airco 300 amp and she is a beast, still in use today. This welder is for the professional and experienced welder. Definitely not for the novice... or the fool heart-ed! She has more controls, knobs, dials, and meters than the space shuttle! But me being on the hunt to save money and determined to get this company up and running in the process, I bought it and figured that I would find a manual some where that would show me how to use it. Ummmmm, no! There is no manual known in existence for this thing. In fact, there was very little info out there at all on the old monster of a machine. Of course, I went where every person with a need to know goes in today's up dated society: You-Tube. I was unable to find the same welder, but I was able to find welders and users of these type welders that provided me with enough instruction to at least teach me how to turn it on. With the help of You-Tube's unlimited resources, my patience, determination (stubbornness) my son turning dials and knobs while welding, I eventually learned to use this thing and became quite good at it. Although there are still many mysteries about the old girl, I have grown to love her, which now explains why the old fellow who sold her to me had tears in his eyes when I loaded up the truck. 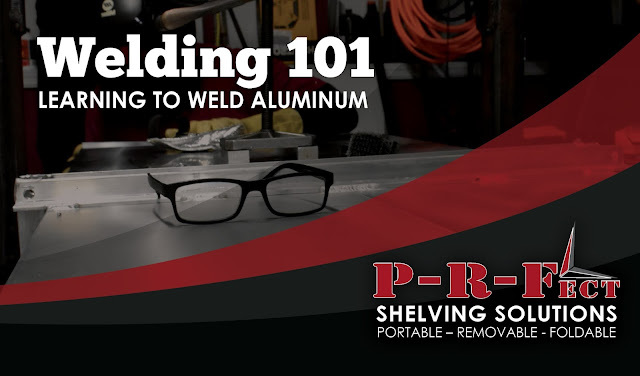 This was the case with PRF shelving in the beginning, and one of the many tasks I had to learn and take on myself due to cost control was buying a tig welder and learning how to use it. I had a little welding experience, so I thought "how difficult could this be?"